Emerald Glen resident Abdullahi “AB” Aliyou on unicycle. There were dinosaurs and pyramids to consider. 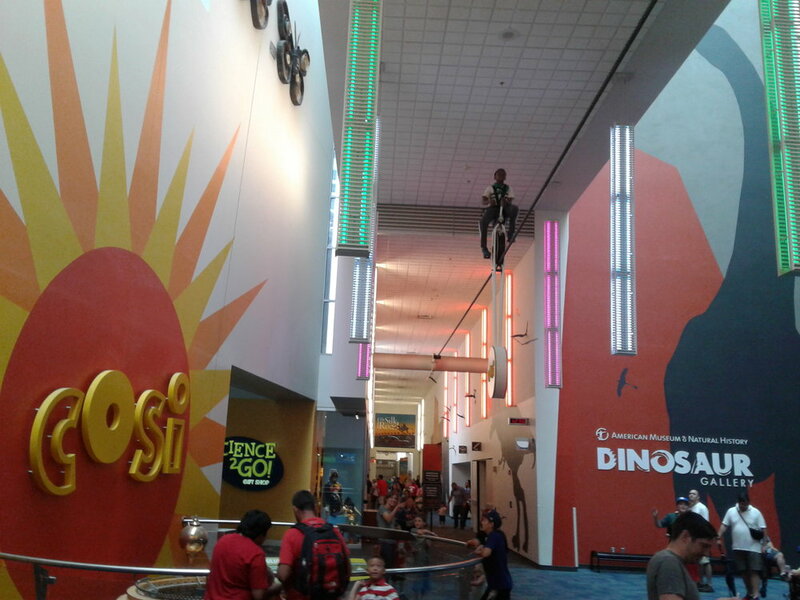 But for 14-year-old Emerald Glen resident Abdullahi “AB” Aliyou, the adventure of a day at COSI in Downtown Columbus was pedaling a unicycle locked to an 84-foot long cable stretched 17 feet above ground. Homeport’s commitment to fun, personal growth and mind-stretching activities for its resident children was once again in full force this summer thanks to funding from Ohio Capital Impact Corporation and the Alcohol, Drug and Mental Health Board of Franklin County. ETSS Lead Youth Program Coordinator Claudia Agyemang, left, at COSI, with Bending Brook resident Hawa Hussien. The Boys and Girls Clubs of Columbus had Georges Creek and Pheasant Run children in sports leagues and Metro Park tours among its adventures. Marsh Run children went to the Columbus Zoo, Indian caves and the Ohio State Fair, thanks to Columbus Area Integrated Health Services. And for the children of Bending Brook, Trabue Crossing and Emerald Glen, their field trips with Ethiopian Tewahedo Social Services (ETSS) included a tour of the National Museum of the U.S. Air Force at Wright-Patterson Air Force Base near Dayton, in addition to COSI. Summer programs can help children retain knowledge, experience social and emotional learning, and go places they may not otherwise, said Claudia Agyemang, lead youth program coordinator for ETSS. The ETSS children, many first-generation Americans, also get a healthy dose of instruction ranging from science to language to physical fitness, Agyemang said. The opportunities also provide some bragging rights. Bending Brook's Maryana Mohamed at COSI. While Emerald Glen’s Aliyow said his unicycle adventure was a lot of fun, his tour of the dinosaur exhibit from the American Museum of Natural History was bound to be a topic of discussion at home as well.